Background: The Fc glycosylation of immunoglobulin G (IgG) is well known to associate with rheumatoid arthritis (RA) disease activity. The same may be true for other classes of Igs. 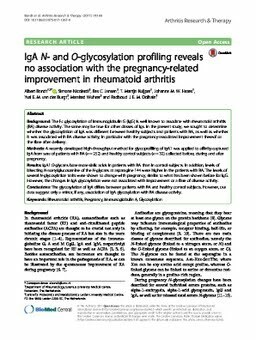 In the present study, we sought to determine whether the glycosylation of IgA was different between healthy subjects and patients with RA, as well as whether it was associated with RA disease activity, in particular with the pregnancy-associated improvement thereof or the flare after delivery. Methods: A recently developed high-throughput method for glycoprofiling of IgA1 was applied to affinity-captured IgA from sera of patients with RA (n = 252) and healthy control subjects (n = 32) collected before, during and after pregnancy. Results: IgA1 O-glycans bore more sialic acids in patients with RA than in control subjects. In addition, levels of bisecting N-acetylglucosamine of the N-glycans at asparagine 144 were higher in the patients with RA. The levels of several N-glycosylation traits were shown to change with pregnancy, similar to what has been shown before for IgG. However, the changes in IgA glycosylation were not associated with improvement or a flare of disease activity. Conclusions: The glycosylation of IgA differs between patients with RA and healthy control subjects. However, our data suggest only a minor, if any, association of IgA glycosylation with RA disease activity.